A Lot On My Plate: Was mache ich mit dem Eigelb? Was mache ich mit dem Eigelb? Or: what to do with the yolks? One of the delights of the internet (at least now, since about google) is that you can just type in anything and get an answer. (I won't at this point go into details over what sort of things I've tried in the small parts of the hour...just for fun, you understand...). But when I'd baked my hazelnut macaroons, this is exactly what I did - I typed in: Was mache ich mit dem Eigelb? And what was the answer? "Eierlikör, natürlich!" Well, not so naturally to me. Sure, I make advocaat more or less every Easter, when I end up with masses of egg from blown out shells - but for that I use the whole egg, not just the yolk. But, after looking at recipes on the net, it seems that this is actually more the exception than the norm - a lot of them use the yolk only. Excellent. Another wonderful bit of information is the fact that there are many, many ways of achieving this quintessentially Dutch liqueur (Or is it?? See below! ), and I am delighted to find that I don't necessarily need evaporated milk - which my Mum's recipe asks for but which isn't the sort of thing I normally keep in my cupboard and which they don't sell at Lidl (just over the road from me - too close for comfort, i.e. I resent having to actually DRIVE somewhere for my food...). If yes, that would be incredibly useful (as we seem to have actually used up [drunk???!!!] all the Pott 54, and don't quite know how to light the Feuerzangenbowle this year... but I'm digressing as usual....). ANYWAY, this is the easy peasy way, using brandy and evaporated milk. Blend all ingredients in a blender. Pour into sterilised glass bottle. My bottlle is half way empty as we speak, and what is left is not worth taking anywhere... I rest my case. The natives of the Amazon region had a drink called 'abacate', made with avocado, which the Europeans discovered in the 17th century. When they added rum and demerara sugar, 'advocaat' in its original form was invented - apparently the egg yolks were simply a substitute for the avocado!!! Hmm, I wonder what it would be like with avacado? - Not exactly less calorific but better for the cholesterol conscious. Anyway, there are lots of variations on this. A lot of recipes use cream instead of evaporated milk, icing sugar instead of caster sugar and add vanilla sugar; the alcohol used also varies - it seems a lovely field for experimentation!!! For a chocolate and/or moccha variant: add nutella or cocoa and/or instant coffe or Camp (a chicory & coffee essence). 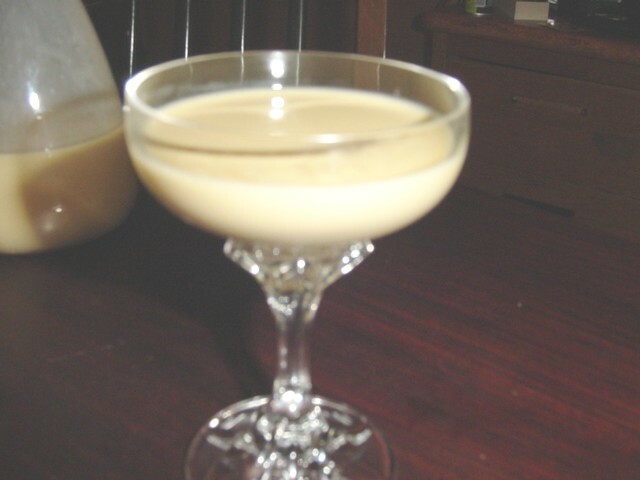 Some people claim that egg nog (or egg flip etc) is superior to advocaat - see a very illuminating entry over at the traveler's lunchbox under the heading: Top Nog. What a star - totally against the diet, of course, but, hey, Christmas only comes round once a year. Hope you had a good one, and are now ready to start partying in the New Year. An exceptionally wet New Year's Eve? was my first reaction - but then I realized you must have been using a foreign keyboard!! A very happy New Year to you, too!! And I'll be delighted to give you my top three diet tips!! And yes, I DO need to get back on a diet - see next entry! !